Shares of the Budweiser maker took a spill on a weak earnings report and a surprise dividend cut. Shares of Anheuser-Busch InBev NV (NYSE:BUD) fell last month after the global alcohol giant posted disappointing earnings results and said it would cut its dividend. 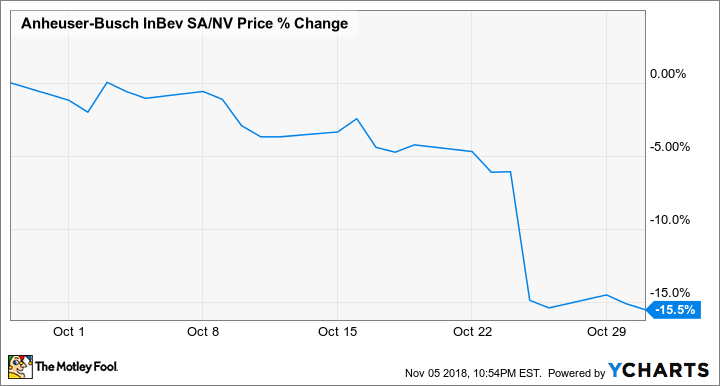 The news was the latest evidence that the company's merger with SAB Miller and its acquisition of a slew of craft beer brands, which comes as growth in the once-hot market slows, have not paid off the way investors hoped. According to data from S&P Global Market Intelligence, the stock finished the month down 15.5%. As you can see from the chart below, shares were sliding for the bulk of October, but plunged on Oct. 25, when the disappointing earnings report came out. Organic revenue at AB InBev, which excludes the impact of acquisitions, divestitures, and currency fluctuations, increased 4.5% to $14.7 billion. However, reported revenue fell 10% to $13.3 billion, pressured by hyperinflation in Brazil and Argentina, and as trademark beers like Bud and Bud Light lose market share in the U.S. Organic volume was up 0.2% in the quarter. On the bottom line, adjusted earnings per share fell from $1.19 to $1.16, topping analyst estimates by $0.01. However, the real reason for the sell-off seemed to be the surprise dividend cut. The Budweiser parent had offered a 6.2% dividend yield, making it highly appealing to income investors, but management decided to slash it in order to reduce its debt burden following its acquisition of SAB Miller. The company said it aimed to bring its debt-to-EBITDA ratio back down to 2, though it said it planned to go back to increasing the dividend after the reset. Anheuser-Busch InBev continues to face a number of challenges, including the decline of macrobrews, slowing growth in craft beer, weakening currencies in emerging markets, and higher interest rates, which makes its debt more expensive. Nonetheless, management said it still expected strong revenue and EBITDA growth in 2018. Shares are now down 32% year to date amid broader industry struggles, but the company's brand portfolio and solid profit generation should eventually put a floor on the stock.